Los Angeles isn't generally famous for its innovative urban design. But there have been many attempts to transform the city into a modern metropolis through visionary architecture and transportation projects. In their exhibition Never Built: Los Angeles, the Architecture and Design Museum is showing off the coolest of what LA could have become. This monorail system would have carried passengers between downtown and LAX. Early plans for LA's subway system featured extensive coverage throughout the city—a far cry from the limited routes of today. In the end, it was money and politics that dictated what was eventually built. The LA County Museum of Art considered this ambitious proposal with a huge canopy roof. Ultimately, the board voted for a more conservative proposal. 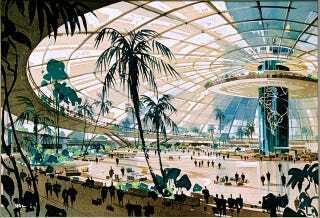 An original plan for LAX had a glass dome covering the entire airport. Apparently, there was also talk of building it on an island off of Santa Monica. LA's heavy traffic forced planners to consider radical measures like this off-shore highway in Santa Monica. It was scrapped—to the delight of beach-goers. This 1300 ft tower built with magnesium was proposed for the 1939 World's Fair.